Okay, maybe I don’t live in America, but I’ve been following the 2008 presidential face-off very carefully. It’s interesting and besides, America is relevant to all of us. I want them to have a president that will allow ordering from Amazon to become cheap again. However, I recently came across some news which has swayed my support for a certain candidate. Democrat Barack Obama is a cyclist, albeit a road cyclist *yuck*. Nonetheless he is still a cyclist. A man on two wheels. He is one of us. Interestingly, Obama is the only one of the Democratic presidential candidates who openly encourages bicycle transportation *awesome*. 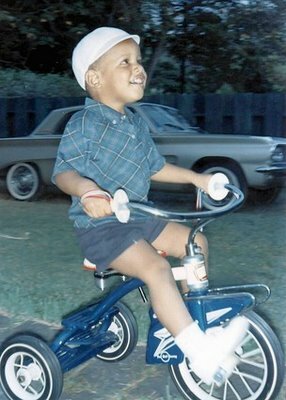 And just to prove that I ain’t kidding, here’s a picture I found in the archives, proving Obama’s been a cycling enthusiast from a young age. Unless I discover that Sarah Palin is an MTB enthusiast in the next couple of days, Barack is going to be my hero for a while. 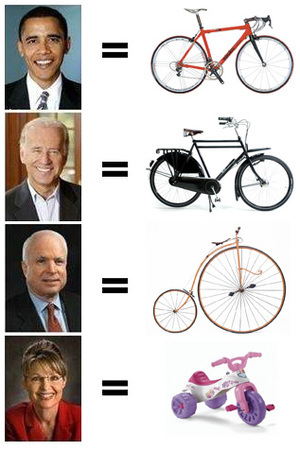 Anyhow, I’ll love and leave you all with a funny caption I found about the American elections and cycling.